At Turks’ Greenhouses we grow over 50,000 mums on site for the fall season and are one of the largest mum growers in Lake County. We take pride in growing the highest quality mums for both the home gardener as well as the top local landscape companies. Our mums are available in three different sizes: 4.5”, 2 gallon, and the 14” Monster Mum. With a complete selection of varieties, colors and sizes, you are sure to finds what you are looking for. 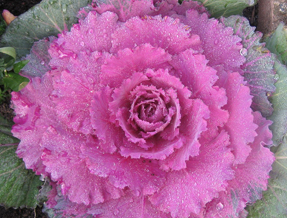 Ornamental cabbages and kales are indicators of cool weather. As temperatures drop the centers (white, pinks, purples, and reds) become more pronounced. Whether its flat leaf curly leaf or cut leaf you’re looking for, we have them in a number of sizes to provide you with color through the fall into the winter. Pansies and violas are great additions to any planting whether it is in the ground or containers. Being cold and frost tolerant, pansies are perfect for fall. If planted in the ground in the fall, pansies will many times overwinter and flower again in the spring! Our pansies are available in all colors and come in flats ready to go. If you’re looking for something interesting to add to your containers for the fall we’ve got it! We carry a selection of frost tolerant annuals and perennials that will look great well into the season. Whether it’s the flowering butterfly daisies, ornamental grasses, tricolor sages, or the latest variety of Heucheras, these plants will amaze you with their late season performance. Nothing says fall like a big orange pumpkin. Our large selection of homegrown pumpkins, squashes, and gourds are sure to please. Locally grown corn stalks, broom corn, and straw bales are available as well.